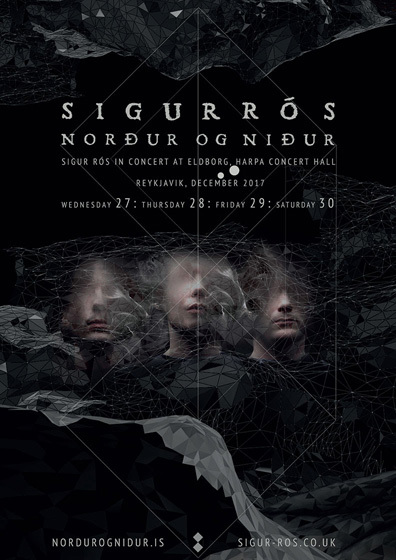 Iceland's Sigur Rós have announced Norður og Niður, a new six-day festival at Reykjavik's Harpa venue from December 26 - 31. The band will perform four shows in Harpa's main hall, Eldborg (which has a capacity of only 1,500 per show), on December 27, 28, 29, and 30. Today we posted our interview with the band's Georg Holm about Norður og Niður and the challenges of recording their new album. "We've got loads of ideas, but there are not many I can confirm right now," said Holm in our interview. "We will be playing four shows but we're still working on everything else. I can definitely promise a very unique experience and some of the ideas, to be honest, are quite outrageous. [Laughs] It's going to be fun. We don't want it to be too serious but fun. It's not a music festival or an art festival, but we'll definitely have art installations and dance pieces and bands playing and events that will be kind of weird. There will also be something involving Christmas music. I can tell you that." A press release further describes the festival as such: "Elsewhere in Harpa, Norður og Niður will host musical performances, art installations, dance pieces, film screenings, spoken word and impromptu happenings, many of them featuring the extended network of friends and collaborators that they have met and worked with throughout their twenty-plus year career." There will be full travel and tour packages available. Tickets for the Sigur Rós performances and travel packages will go on sale to public on next Monday May 15, although the rest of the full program for Norður og Niður won't be announced later in the summer. There is a fan pre-sale this Friday, May 12, (register at www.nordurognidur.is). Below is a trailer for Norður og Niður and read our interview with the band here.